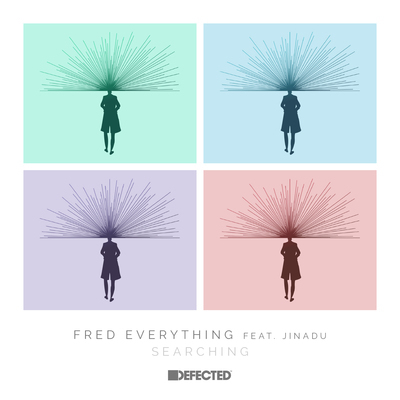 Four producers from around the world come together on ‘Searching’ by Fred Everything, featuring the vocals of London songwriter Jinadu. With a trio of versions courtesy of Fred, the release opens up with the brand new Acoustic Mix, and also includes the original version and Lazy Dub. Atjazz, Deetron and Jazzuelle are on remixing duties, each exploring the deepest edges of this track in their own ways. Fred Everything’s fellow Lazy Days label mate Atjazz has come up with two versions of ‘Searching’. His extended remix amps up the bass, while giving the gorgeous vocals room to breathe. The Floor Dub takes the instrumental in a different direction, giving it extra funk with layers of syncopated percussion. Swiss producer Deetron has applied his skills to the track, also coming up with a remix and a dub version. Both versions increase the tempo of the original track, giving it more sense of pace and urgency. Jazzuelle is apparently a rising star from South Africa who is part of the Atjazz family in the UK. Fred Everything has previously named Jazzuelle among his favourite South African producers so it makes sense that he got him on board for this. His remix is laidback with a gradual, blossoming build.